The Source Audio Nemesis Delay Pedal is compact, powerful, and easy to use with unrivalled tone and flexibility. Featuring 12 on board delay effects, switchable sub divisions, hold function, tap tempo, MIDI control and much more. 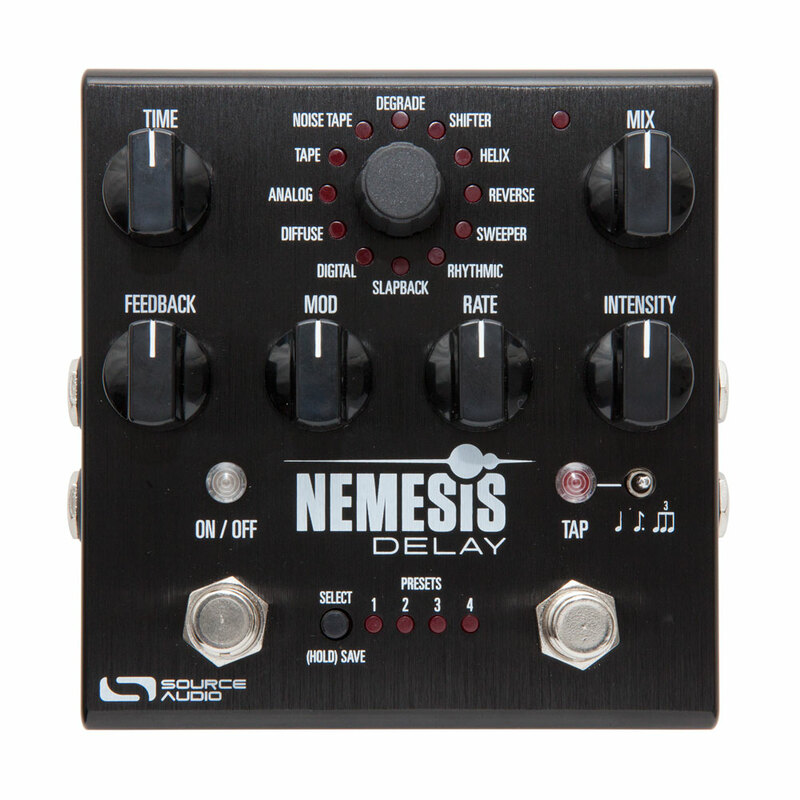 Nemesis captures the full spectrum of delay effects, the Source Audio engineering team spent over a year studying numerous iconic and sought after tape and bucket brigade delay units with a staunch dedication to identifying their every nuance and idiosyncrasy. The Neuro Mobile App (free download for iOS or Android) gives very powerful tone editing options through additional eq and effects settings, gives access to 12 additional delay presets, switches the 4 on board saveable presets up to 8 and switches between true and buffered bypass, stereo routing options and more. Stereo input and output jacks provide dramatic stereo ping-pong and stereo phase inversion effects and can also be rerouted to create an external effects loop either pre or post effect. An external expression pedal can be used with the pedal and can be assigned to control any combination of knobs.